The first thing someone sees when they walk into your house is your entry way. The decor of your entry way sets the tone for the rest of your home. When coming up with a design scheme for your entry way, think of your entry way as the branch of a tree. All the other rooms in your house are twigs and should be connected in someway to that branch. 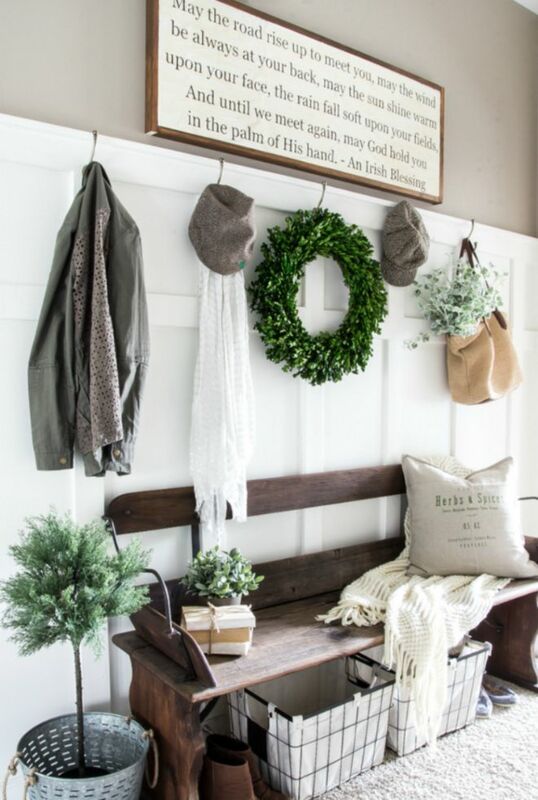 If you want to leave a lasting impression on those who visit your home, you can’t go wrong decorating your entry way in farmhouse style. Farmhouse style entry ways scream, “Welcome to my home,” but in an “Aww, shucks,” hospitable kind of way. Need ideas for your farmhouse style entry way? Here are some of the best farmhouse entry ways we’ve come across. 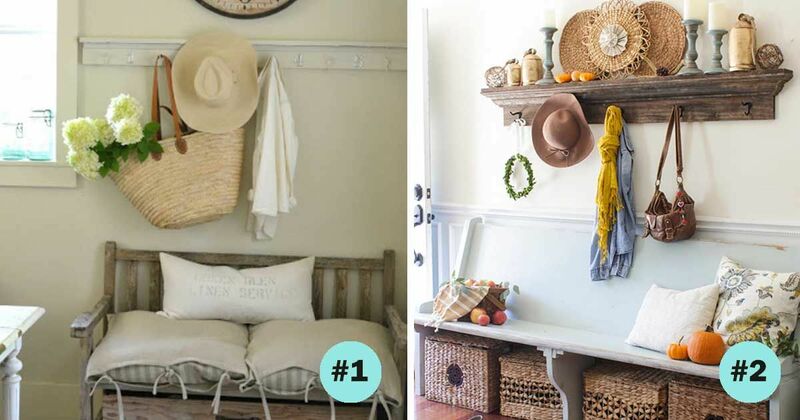 If your entry way is short on space, consider a bench. Not only does it provide guests with an excellent overview of what they can expect in the rest of your farmhouse-inspired place, guests can sit on it in a pinch. 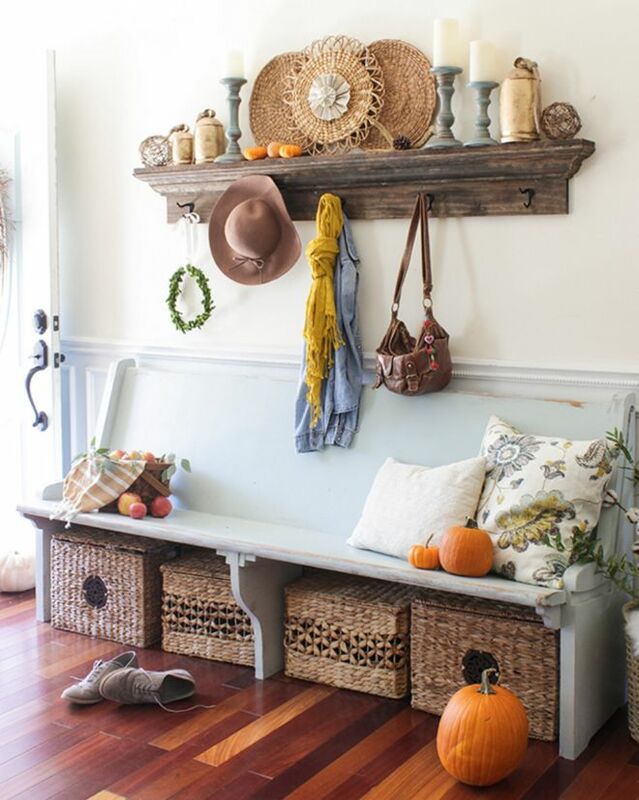 Decorate the bench with charming accents such as pillows and other knickknacks you'd find in an old farmhouse. 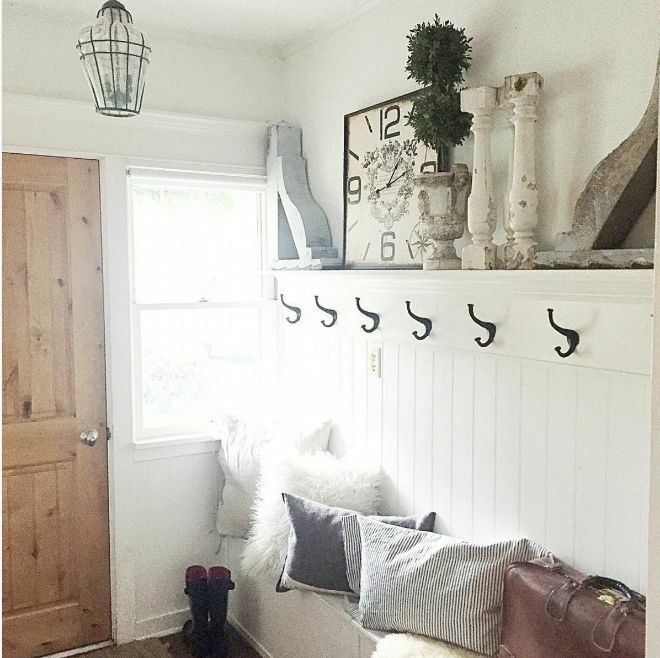 A well-designed farmhouse entry way should give people a place to put their stuff. Hooks and a raised wooden tray are a perfect, easy way to give everyone somewhere to put their things. A destressed backboard and stool add the farmhouse touch. Who says bins have to be boring? Metallic bins and an additional basket help conquer the "Clutter Monster" by giving you and your guests a place to put purses, coats, shoes and keys. A chalkboard gives you a place to write down things you don't want to forget or a welcoming message for your guests. Different materials and textures can transform an entry way. You don't need much to have a stunning entry way. 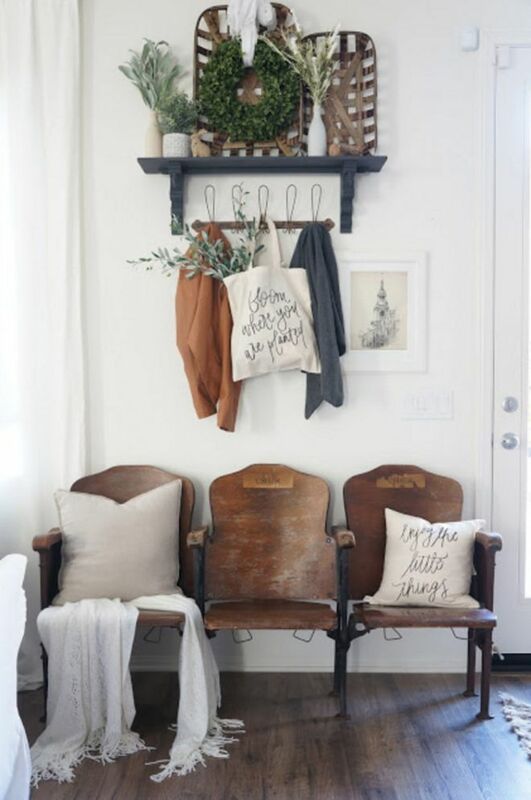 A shelf, hooks and extra seating are functional, yet simple, ways to add character to a small entry way. 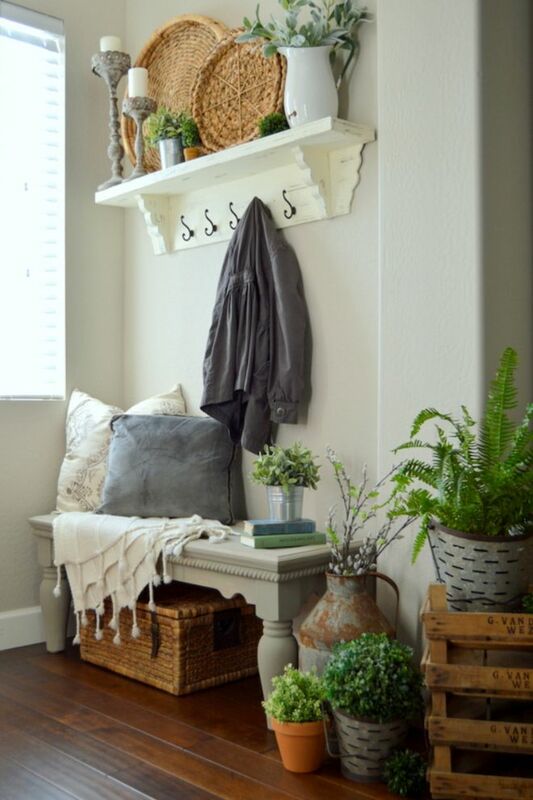 Tobacco baskets and simple plants add homey charm to the small space. If you have more space in your entry way, trees and other greenery such as wreaths add an extra level of charm to an entry way. A bench with space underneath can also be a great place to store bins. A hand-painted Irish blessing greets all who enter and gives a warm send-off to leaving guests. Wood is typically one of the predominant features in a farmhouse-style entry way. 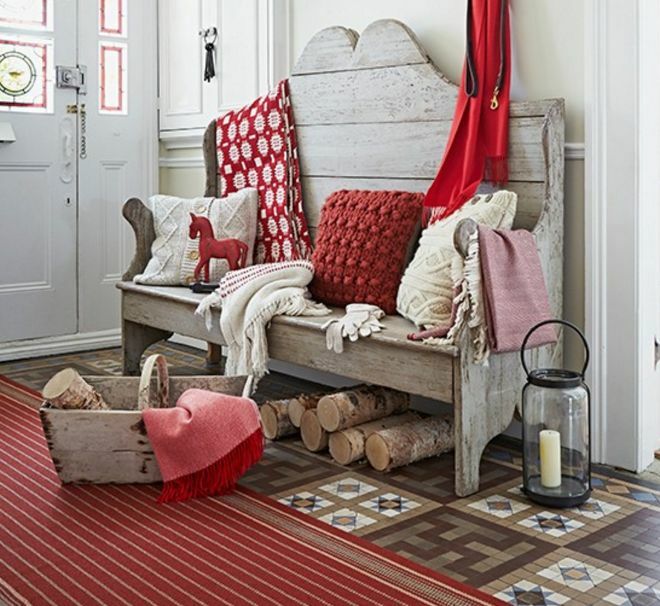 A bench made entirely out of wood and a splash of color such as red, make for an awe-inspiring entry way. 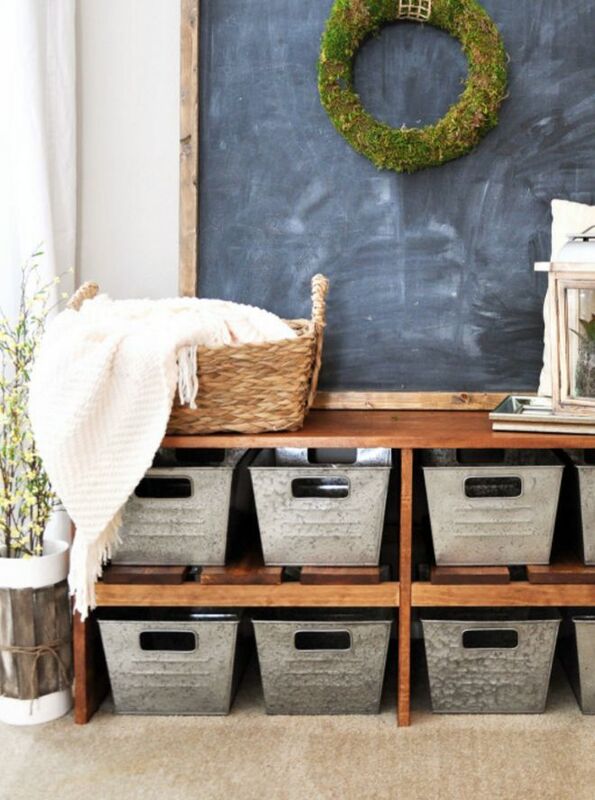 Wicker baskets, refurbished wood and upcycled metal containers can also add the "farmhouse" feel to an entry way. Farmhouse style is popular because it combines the beauty of the natural world with modern living. In-season touches such as pumpkins and fruits and vegetables can make a farmhouse entry way feel quaint and teeming with life. 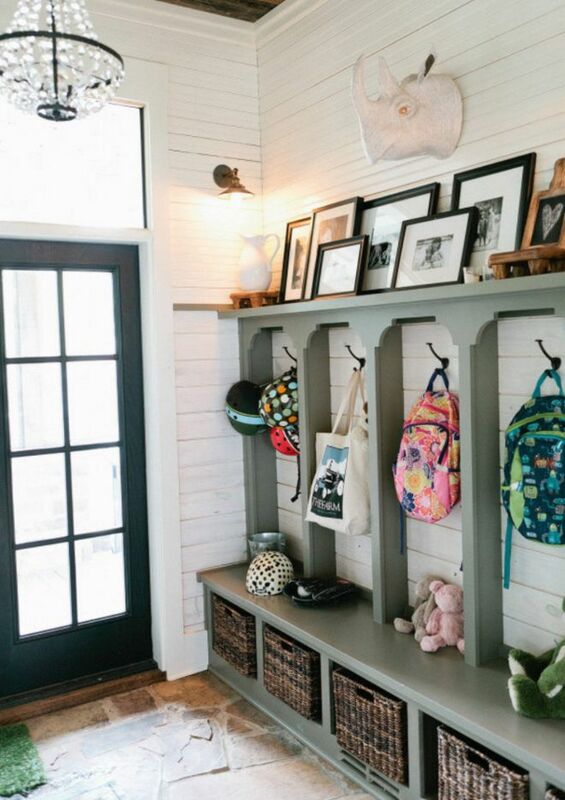 A mudroom is a must-have if you have a large family. It's the perfect place to store bags, pet stuff and equipment. 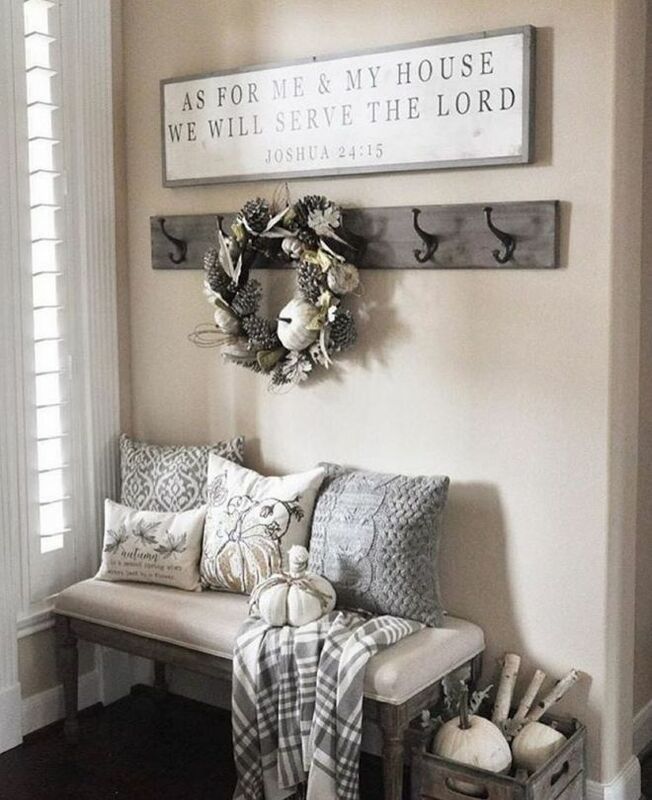 Hooks, a shelf and a bench are great place to store items and show off great farmhouse decor pieces. A wall with a shelving system that has room for photos, hooks, a bench and cubbies for storage keeps everyone's things organized -- a great solution for big families. 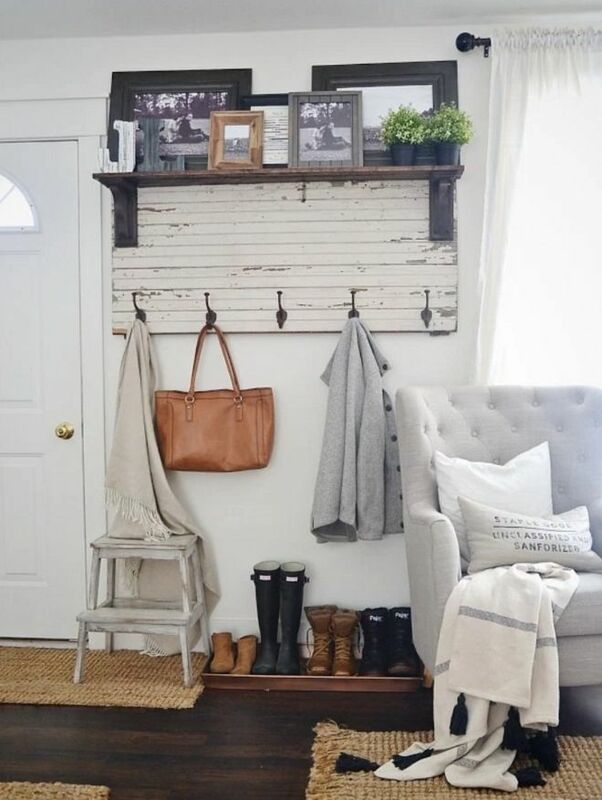 Keep track of shoes and other items you don't want dirtying up your house with a grab and go shelving area as your mudroom. 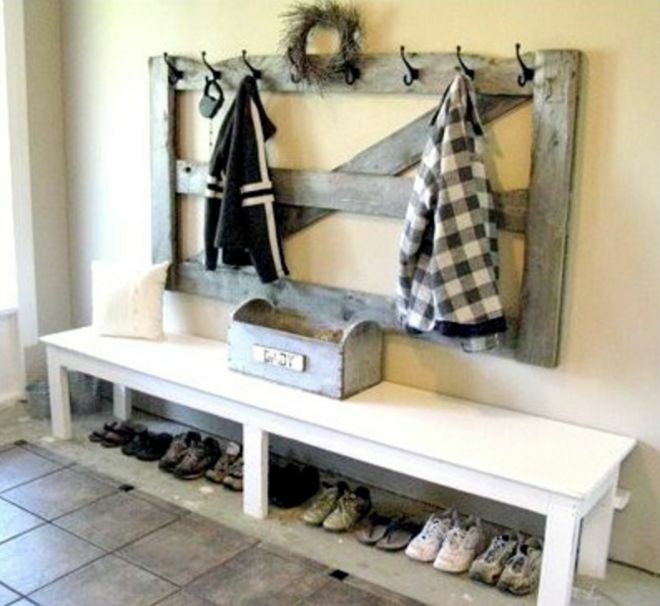 This DIY mudroom set up uses an old wooden gate to bring the farm into the farmhouse. 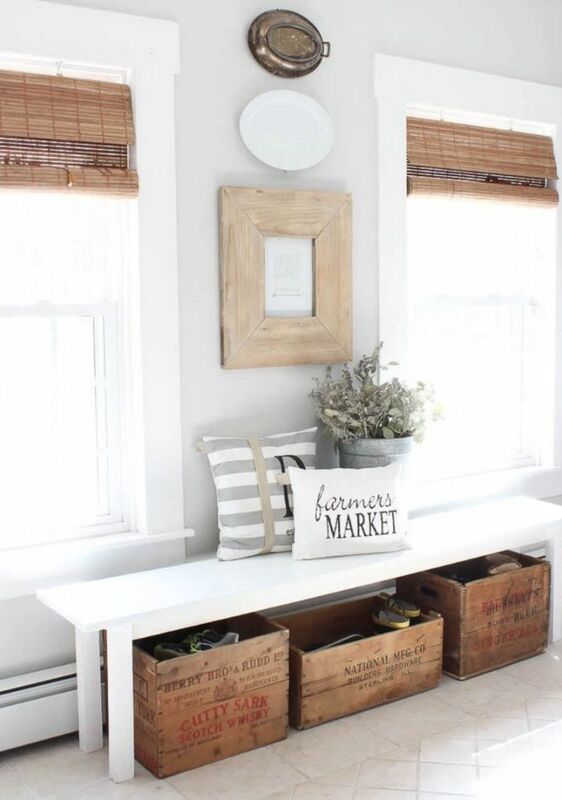 Wine crates make great storage boxes and add the refurbished charm sought after in the farmhouse style. 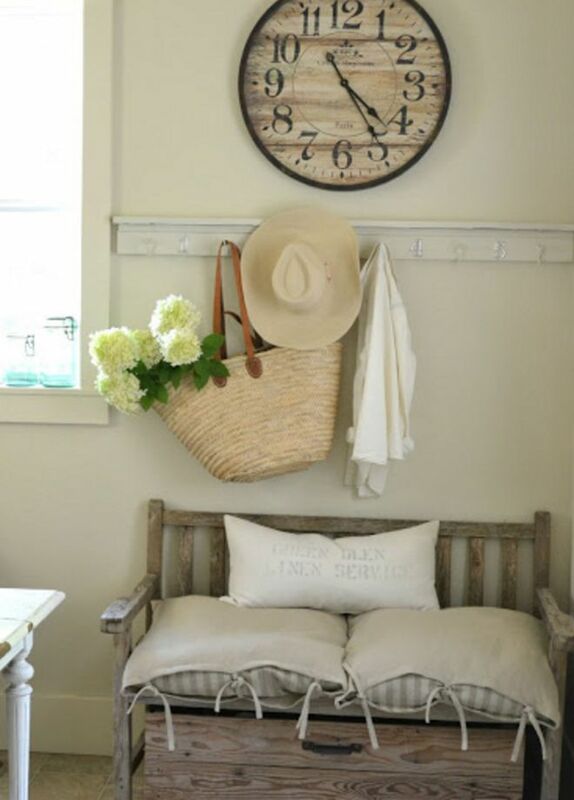 A simple wooden bench with cushions and a drawer underneath make the perfect, quaint mudroom. If you loved these farmhouse entry ways, be sure to SHARE them with your friends!